FINAL CALL for REGISTRATION, September 2nd, 2015! **There is a short, outdoor walk between the location of dinner and the program. Please plan accordingly. There is no guaranteed parking at the Cartwright Auditorium and walking is recommended. Cost: Akron-Canton CSI members & AIA Akron members – included in 2015 dues. AIA Eastern Ohio members, register as AIA Eastern Ohio, pay by credit card or PayPal or check – must be received at the office by Sept. 2. No fees collected at the door. Non-chapter members of CSI or AIA, and guests – $50.00, to be paid in advance by the Sept. 2 RSVP deadline. Please make checks payable to Akron-Canton CSI. Payment may be made by credit card at the time of registration. 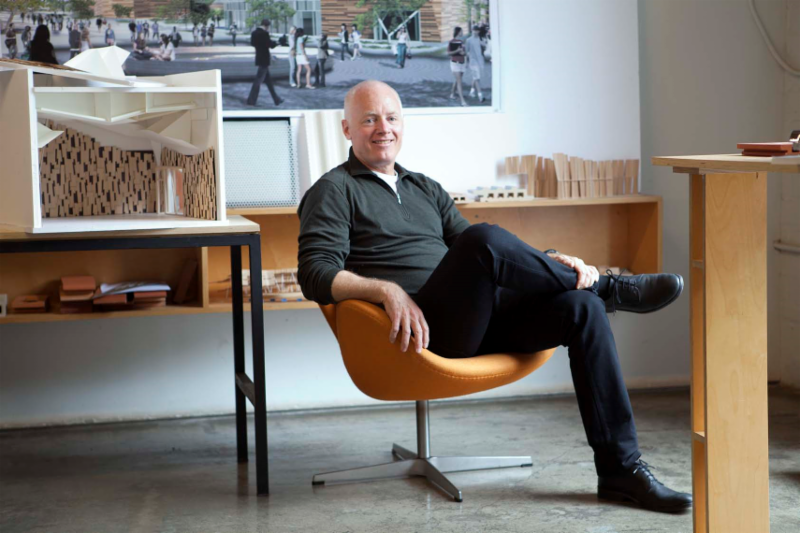 Kevin Daly Architects believes architecture must transform the everyday built environment. Established in 1991 as Daly Genik Architects, Kevin Daly Architects practices the practical magic of architecture as an alchemy of craft, materials, and form. Kevin Daly Architects weaves innovation into its projects by bonding technology with fabrication, sustainability with urbanism, and livability with economy. The firm’s award-winning portfolio includes environmentally and socially responsive educational, residential, and institutional projects ranging in scale from single room artist work spaces to campus master planning. The practice has been recognized with over thirty AIA awards, the Rudy Bruner Foundation’s Gold Medal for Urban Excellence, and the AIA Los Angeles Firm of the Year Award. For over twenty years, Kevin Daly, FAIA, has made architecture that explore the paradox between urban conditions and the consequences of intervention. Projects by Kevin Daly express his belief in an architecture that performs on every level: environmentally, structurally, economically, and aesthetically. His work exhibits the benefits of research into advanced and unconventional building technology. His projects include expertise ranging from public schools, custom residences, university buildings to affordable housing. 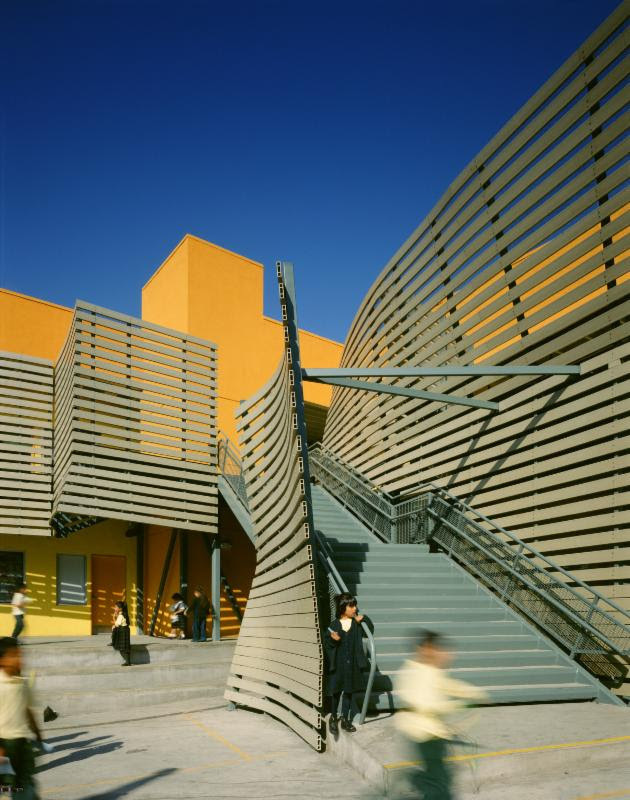 He is a design faculty member at UCLA and has served on juries or lectured at institutions internationally, including Stanford University, Cornell University, Rice University, SCI-Arc, the Architectural League of New York, the University of Texas at Austin, and RISD. Kevin received a Master of Architecture degree from Rice University and he holds a Bachelor of Architecture degree from the University of California in Berkeley. He is a Fellow of the American Institute of Architects and has served as a board member for the AIA Los Angeles Chapter. 1.5 LU/HSW, AIA CES approval to be determined. This course will introduce participants to case studies of work by Kevin Daly Architects. For over twenty years, his firm has worked in communities and urban setting s with the goal of making building perform on every level: environmentally, structurally, economically, and aesthetically. Case studies will include in environmentally and socially responsive educational, residential, and institutional projects with particular emphasis on affordable housing, water conservation, and educational facilities with innovative learning environments that consider the health and well-being of the learner. 1. Participants will be introduced to ways of transforming sites into buildings that reconnect the urban fabric and restore community identity; attendees will be able to compare examples and apply these strategies to their own practice. 2. Attendees will be able to outline characteristics affordable housing while also emphasizing sustainability, water conservation, and the human welfare of residents. 3. Attendees will compare the differences between traditional, flexible, and open-ended learning spaces and when to apply these in elementary school design; participants will be introduced to a case study with special emphasis on ways to connect schools to the civic fabric and use the spaces on site to promote community health and learning within the schoolyard. 4. Participants will recognize climactic differences where conservation of water is of paramount health and environmental concern for architects working in arid climate conditions; site strategies and use of building systems will be introduced to attendees. If you have questions, please don’t hesitate to call me. Contact information below. Thank you for your attention and response. I look forward to seeing you at the meeting. Come check out one of Akron’s award-winning Breweries while you learn how to create better and more efficient projects using building modeling! High-performance building standards continue to evolve, becoming more stringent and often causing confusion throughout the industry. Many of us design professionals have agreed to improve the performance of our projects in parallel with these criteria, but how do we get there? This session will review each of the mentioned sustainable building standards to offer an understanding of the associated goals, and outline design concepts and processes for achievement of these guidelines. AIA Akron members – included in 2015 dues. Non-chapter members of AIA Akron – $25.00, to be paid in advance and received at AIA Akron office by the February 18, 2015 RSVP deadline. AIAS Members pay $10 to be paid in advance by the February 18, 2015 RSVP deadline. This tour is designed to provide the attendee an understanding of some of the sustainable design features implemented on the Oberlin College and Conservatory campus. We will visit the Adam J. Lewis Center, The Bertram and Judith Kohl Building, Robert A. Kahn Hall and the Williams Field House. The tour will allow the attendee to experience new and old sustainable building materials and systems, along with observing the many ways the College has implemented sustainable strategies over time the impact of having established LEED Silver as the minimum standard for new buildings on campus. The tour will be conducted by Steven Varelmann, College Architect. The objectives of the tour are: 1) Building Design – The attendee would be able to understand the significance of Building Orientation and how it relates to energy (i.e. passive heating), day-lighting and views. The presenter will provide a discussion on how each architect positioned their building on their respective sites to accomplish these goals. 2) Energy Efficiency – The presenter will describe the energy efficiencies utilized in groundbreaking Adam J. Lewis Center the Robert A Kahn Hall. The attendee will be able to observe the 3,700 square feet of photovoltaic cells that allow the A. J. Lewis Center to function as a net energy producer for portions of the year. 3) Material and Systems – Observe the impact that the hidden acoustical needs of the Kohl Building had on the building design. The attendee would be able to discuss the design of the complex wall systems and the life cycle cost decisions that were explored that will result in less energy consumption; as well as demonstrate how codes, regulations, controls, life safety and the needs of the unique program impacted these decisions on the design. 4) Site Design – The attendee will examine the methods and materials used by the designers to contain storm water on site. They will be able to see how the design of the A. J. Lewis Center took into consideration the use of gray water produced by a Living Machine that also keeps the Center’s water needs to a minimum. Just north of I-80, between Toledo and Cleveland, is an unexpected educational facility that is setting a shining example of sustainable building for ecological and human health. Completed in 2000, the Adam Joseph Lewis Center for Environmental Studies is an ongoing green build experiment, as its energy performance is studied and adjusted as green technologies continue to evolve. It just goes to show that you don’t have to live in sunny California in order to efficiently harvest solar power. Everyone will meet at the AIA Akron Office, 2841 Riviera Drive. Park in the lot next to the AIA Office building (not in the parking lot associated with the offices). Everyone should be at the AIA office parking lot no later than 7:15 AM to depart no later than 7:30 AM. We will be returning to the AIA office 12 noon. Lunch is on your own. Upon arriving at the college, we will meet at the Adam J. Lewis Center for Environmental Studies, 122 Elm Street, Oberlin, OH, 44074. Oberlin College is close to several interstate highways, including I-80 (the Ohio Turnpike), I-480, and I-90. The college is located in Northeast Ohio at the junction of state routes 58 and 511. Please use these driving directions to the Carnegie Building, 173 W. Lorain St., which houses several administrative offices including admissions. Use these directions in conjunction with a map. I-80 (Ohio Turnpike): Travel west to exit 140 (Amherst/ Oberlin interchange). Go south for six miles on Ohio Route 58 to Lorain Street (Ohio Route 511). Turn right on West Lorain Street. At the next intersection, turn right on North Professor Street. The Carnegie Building is on your right. I-90: Travel west and exit at Ohio Route 2 west. Exit at Ohio Route 58 in Amherst and follow the directions above. I-480 (from Cleveland Hopkins International Airport and points east of Oberlin): Follow I-480 west as it becomes Ohio Route 10 west toward Norwalk as it becomes Ohio Route 20 west. Take ramp right for Ohio Route 511 toward Oberlin. The Oberlin exit, Ohio Route 511 west, is also Lorain Street. One block after passing the intersection of Ohio Route 58, turn right onto North Professor Street. The Carnegie Building will be on your right. Travel on I-71 north to I-80 west (Ohio Turnpike). Take exit 140 (Amherst/Oberlin interchange) and go south for eight miles on Ohio Route 58 into Oberlin. At the intersection of Ohio Route 58 and Lorain Street (Ohio Route 511), turn right on West Lorain Street. At the next intersection, turn right on North Professor Street. The Carnegie Building is on your right. Alternate routes: Take I-71 north to exit 196 (toward West Salem). Go north on Ohio Route 301 to Ohio Route 303. Go west on 303 to Ohio Route 58. Take 58 north into Oberlin. You also can follow I-71 north to exit 186 (toward Ashland). Go east on U.S. Route 250 to Ohio Route 89. Go north on Ohio Route 89 to Ohio Route 58. Go north on Ohio Route 58 into Oberlin. Turn west (left) at the intersection onto West Lorain Street. At the next intersection, turn right on North Professor Street. The Carnegie Building is on your right. Take I-80 (Ohio Turnpike) east to exit 140 (Amherst/Oberlin interchange). Go south for eight miles on Ohio Route 58 into Oberlin. At the intersection of 58 and Lorain Street (Ohio Route 511), turn right on West Lorain Street. At the next intersection, turn right on North Professor Street. The Carnegie Building is on your right. Cost: AIA Akron members (including student members) – included in 2012 dues. Non-chapter AIA or guests must pay in advance, by May 28 – $25.00. To Register: Contact Carolyne Tinsley at 330-699-9788 or rsvp@aiaakron.org by noon Monday, May 28. Learning Units: AIA approved 2 HSW/SD LUs for first tour. The tour is equal to 2.0 contact hours for other organizations requiring continuing education. Ilaria holds a Bachelor or Architecture degree from the Polytechnic of Milan, Italy, and a Master of Building Science from the University of Southern California School of Architecture and has also spent a year studying in Valencia, Spain, on an Erasmus scholarship. Over the last ten years, Mazzoleni has investigated issues of sustainable architecture and building technologies, and has participated on international conference on the subject. Her later academic and professional research focuses on Biomimicry: Innovation in Architecture Inspired by Nature. Matthew C. Sutter, our tour guide is originally from the Washington DC area, Matt graduated from Virginia Tech with a Bachelors degree in Architecture and moved to Ohio in 1992. Matt is a LEED AP, is a registered architect in several states and Partner at SōL Harris/Day Architecture in Canton, Ohio where he has led the focus on green building practices. He led the design team for the Bridgestone Akron Technical Center and is involved with the design of the Aultman Compassionate Care Hospice Facility, both of which will be LEED certified projects. Matt lives in North Canton where he enjoys playing hockey with his four boys on his backyard ice rink. Bridgestone Technical Center: The research laboratory for testing new advanced tire compounds and the prototype and quality control engineering offices are designed to reach LEED Gold Certification. The design incorporates many “green” strategies including: Vegetated Roof, Filtered Chemical Hoods to Eliminate Stormwater, Runoff Bioswales, Cistern for Rainwater. The interactive tour of the new Bridgestone Techical Center will review the sustainable features and code-related atrium features. The objectives: 1)Life Safety – The tour will highlight the smoke exhaust system and the sprinkler system requirements that are necessary for life safety in the Atrium. 2) Site Design – The tour will highlight the sustainable site features that increase the water infiltration on the site. Rain Gardens, Bioswales, a Green Roof and an Above Ground Cistern will be reviewed. 3) Energy Efficiency – The tour will highlight the envelope systems including triple pane glass panels, air infiltration membranes, rain screens and lightweight roofing systems. 4) HVAC Systems – The tour will highlight the unique HVAC system that is a heat sink system which results in a 30% energy savings over a conventional design. Limited to 23 people per organization, first come first serve. Learning Units: 1 AIA LU/HSW/SD will be issued for this seminar. This seminar is equal to 1 contact hour for other organizations requiring continuing education. COST – AIA Akron members (including student members) – included in 2012 dues. Sustainable Design, Speakers: Domenic Ferrante, AIA-LEED AP and Matthew Sutter, AIA-LEED AP. This presentation will provide an insight tour of (2) recently completed facilities and how the LEED strategies were implemented in each building. Some of the sustainable design features include building orientation, solar hot water, day-lighting, views, insulated wall systems, pervious pavers, storm water management, material selections, live roof system, heat island affect and energy efficiency. Building Design – The attendee would be able to understand the significance of Building Orientation and how it relates to energy, day-lighting and views. The presenter will provide a discussion on why the building was positioned on the site. Energy Efficiency – The presenter will describe the energy efficiencies utilized in these (2) new buildings. The attendee will be able to observe the Solar Hot Water System that was used to supply the hot water use in the building. Material and Systems – See the results of an insulated wall and roof system to the building and decisions made by life cycle cost that will result in less energy consumption; as well as demonstrate how codes, regulations, controls, life safety and alarm systems impacted these decisions on the design. Site Design – The attendee will examine the methods and materials used by the designer to contain storm water on site. This design took in consideration of preserving the site and dealing with some of the environmental impacts. From the Harris Day Sol parking lot, turn right (south) on Frank Avenue NW. Continue straight ahead until you see the main entrance for both Stark State College and Kent State University at Stark on your left. Turn left and enter parking area. Please follow map to the closest parking areas. Click here for map. The presentation will focus on the role design research and targeted measurement has on improved project impact and design innovation. The discussion will be a case study of Gensler’s Workplace Performance Index (WPI). The WPI measures how people work within organizations and how workplace strategy, planning, and design support its activities. WPI lets those same organizations measure the effectiveness of new and renovated work settings, and benchmark how that performance measures up-before and after a project is completed-against their top-performing peers. Cindy Coleman is a strategic planner with over 32 years in the design industry. As a strategist, Cindy’s role is to steer effective alignment of a client’s organizational goals to a well-informed design response. Cindy holds a faculty position in the department of Architecture, Interior Architecture at the School of the Art Institute of Chicago. Its that time of year again…. making all those personal new years resolutions…. now lets work on the news years resolution for your resource libraries! Take 30 minutes to go through your materials and grab a box or bag, throw them in your car and come on down to 30 N High Street in Akron Ohio from 9AM- noon on February 4th, 11th & 18th! Keep spreading the word to all your local designers and pass this on to at least 5-10 friends! These are drop off dates for architects, interior designers, construction managers, facility managers, workrooms, graphic designers, and reps to drop off expired specification samples to our facility. Examples of materials include carpet, laminate, wallcovering, fabric, tile, brick, stone, metal, glass, and stock photo books, paper sample books. Binders are welcome, please empty the contents in your recycled paper container before dropping off. Volunteers are needed to help receive, sort, and weigh the materials. Please email iida_clevak@yahoo.com with the times and dates that you are available to volunteer. Check out zerolandfill.net for more info or friend ZeroLandfill Cleveland & Akron on Facebook for more details! And, if you’re feeling like donating your time as well! We’d love to have you weigh, sort, and help guests gather samples! For Harvest days, when you can pick up samples, Same place (30 N High Street in Akron, 9AM-noon) on Feb 11th, 18th and 25th! Check back to the facebook page for Cleveland dates during the summer! These are pick up dates for artists, educators, crafters, homeschooler, arts organizations and community programs to pick up the materials samples that we receive from the design community. Examples of materials include carpet, laminate, wallcovering, fabric, tile, brick, stone, metal, glass, stock photo books, paper sample books and empty binders. Please bring boxes and bags to take your materials home.